I left the last post off going to bed after a dizzying 30+ hours of traveling; however, I work up around 7:30am. I was pretty awake but I could probably have gone back to sleep, I just didn't want to. Tricia and I chatted on the computer while I finished packing. The plan for the day was to start out exploring and then meet up with some more Thai associates to show us how to use the transit system, a place for shopping, and food. Peter and I agreed to check in with each other around 10am. Around 10:30am, we set out for our first trek outside. I really wanted to check this park out and it was close to our hotel. I knew it was south of our hotel, my hope was that I knew which direction was south! We took off on foot down the street towards the park but we hit a dead end. There was a small ally way that we took. It looked like a back alleyway between houses but there were also little shops and street venders mixed in. It was really neat seeing everything mashed together like that. If you follow the blue line I've drawn in, you'll see our course. The first turn west is where the alley is. Don't be confused by the map. It's very small and maybe a car could go down it.... maybe. We found walked around Lumphini park for about an hour. It was hot and humid! The heat is similar to KC in the summer but we just aren't used to it. 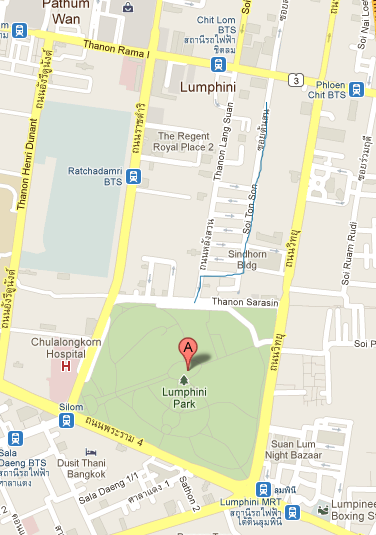 Lumphini Park is a very beautiful park with its trees, bushes, flowers, sculptures, etc. It was donated to the public in 1920s by King Rama VI. The outer road/trail is roughly 2.4 kilometers (~1.6 miles). You'll find all sorts of activity at the park. We saw people practicing Tai Chi, xylophones, drum lines, cyclist, runners, and so on. Peter and I took a different route back to our hotel, just to add to our exploration. Apparently on our block there is a lot of embassies as well. The Netherlands and United States embassies were the prominent ones, which is comforting if we need it! I doubt we will, of course. My "home". If you count 6 floors down from the top, I'm right in the middle. Peter and I returned to the hotel to freshen up a bit before meeting more Thai associates to show us around. Benny, Jingjo, and Toom were our hosts for the afternoon. They took us to a 5 story shopping center, Central Chidlom, that has a food court on the top floor which has many options, such as Thai, Japanese, Greek, and Italian. At this food court you receive a plastic card at first. At each food area you hand them your card and wait for your food to be prepared. Then over to the drink counter and then dessert! After eating, you pay as you exit. I decided to go with Pad Thai with Shrimp and the Thai associates order some dessert. Very very good. We then took the SkyTrain (BTS) to the stop that Peter and I will became very familiar with, the Phrom Phrong station where we will get off for work. It happen to start raining on us so they weren't able to take us to the building. Attatched to this station is another huge shopping center with another food court. Apparently many associates eat there for lunch. At this point the Thai associates left us to fend for ourselves. Could we make it back to the hotel? Hopefully we remembered our stop by the hotel! By this time the rain had stopped and so Peter and I walked to the building to check it out. At this point we went back to the BTS took the SkyTrain to our stop (Chit Lom). We did some grocery shopping and I bought some Coke (need some caffeine to stay awake) and stuff for breakfast and a couple meals. I wasn't too adventurous. It's just like shopping at a brand new grocery store, except you can't read any of the labels! OK, that's not entirely true. Most everything has english, if it isn't the same product we are used to buying anyway. I picked up some apples at one point and as I walked away one of the store employees took them from me. Apparently you must take them to a specific counter to have them weighed and tagged instead of doing it at the checkout. That does seem a lot more efficient! At that point we returned to the hotel. I can't remember what time it was but I forced myself to stay up until 10pm. It was really difficult. I talked to Tricia on FaceTime for a while to try to stay awake but eventually gave up. 10pm and lights out. Sunday Peter and I were back on our own. I woke up around 5am and just couldn't get back to sleep. I laid in bed until 7am when I called Tricia again. I had decided at that point to go for a run in Lumphini but Peter asked me to do the brunch buffet at the hotel. We were given 10 passes to the buffet. It was mostly a typical buffet but with Thai lunch options. The sausage was chicken sausage and the little pancakes had a coconut flavor to them. Peter and I both picked up yogurt. One thing we have quickly learned here is that corn is treated similar to fruit. There was corn in his yogurt and I've seen it as toppings for ice cream! After brunch I got my first workout in and ran 3 laps at Lumphini Park. With the humidity and heat, I walked about half of the last lap. I'm hopping to get there before or right at sunrise in the future to beat the heat. After the workout and NECESSARY shower (thank goodness no one else was in the elevator with me), Peter and I set out for our next adventure: JJ Weekend Market. This is basically a huge flea market where you can buy pretty much everything (and shipping services to send everything home to KC). There is art, clothing, electronics, food, toys, and whatever you could imagine... assuming you could find it. This place is absolutely monstrous and Peter and I probably only hit 10% of the place in the 90 minutes we were there. It's simply amazing how much stuff they had there! After talking about it with co-workers they were surprised we went on our own... and made it out. Yeah... we did get lost, actually... but only briefly. Dinner was back at the Central Chidlom Food Court. I really ventured our for dinner and had Italian... not quite Cafe Trio's MacDaddy :). First day at work! We immediately met a lot of people. I'm horrible with names so it's been interesting. I stopped by to say Hi to my project team and then another Expat showed us around the office building. One of the teams took us to lunch to one of the local restaurant (Sabaijai?) and ate a ton of food. I think 10 plates of food passed around us. I've tried to do my best and eat whatever is placed in front of me, and so the fried baby crabs went down the hatch! After work, Peter and I had some drinks at the hotel bar again. Can't exactly remember dinner, I may have gone back to my room and went to sleep. I could only manage to stay up until 9pm. I managed to hit the gym for the first time. If I hadn't remembered that I was out of the US, I got another shock when I turned on the treadmill... it was in kilometers! So I relied on my 5k = 3.1 mile translation to figure out the speed but wasn't completely successful. I just ran by heart rate. This time lunch was at the hotel across the street with a handful of Thai associates. It was a buffet with various Thai dishes. I'm quickly learning to enjoy Thai cuisine. Peter and I went back to the hotel room and I fixed a halfway successful risotto (I need some chicken broth). I had to stay up passed 9pm because of a conference call with work in KC. I made it to the gym again this morning, but just stuck to the stationary bike. I think the bike was in mph because I'm hoping I wasn't riding at 6 mph speed but at least a 10mph speed! Lunch again was at a Thai restaurant (Chapter 31) but this time it was with 3 Expats. It appeared to be at a little more upscale Thai restaurant. I had some kind of beef esan dish. It was yummy. Yeah, I really branched out tonight. Margaritas and enchiladas. Yummy! Happy hour was definitely on and here it is buy one drink get one free. This confused us when Peter ordered a beer and the waitress just brought two bottles. Very very nice! Back at the gym in the morning to work off those two margaritas and enchiladas. I managed to get to the gym 15 minutes before it opened so I could get 45 minutes on the treadmill in. So far I've been able to keep up with the training! Lunch was with the another group of Thai associates but there was a change up in the menu. We visited a Japanese restaurant. Take your shoes off and sit on the floor. I may be a runner/traithlete, but I'm not that limber to sit cross-legged for an hour+! I knew dinner that night was going to be fairly big, so I decided to stick to tempura vegetables and shrimp. A whole fried fish. I must say that it was pretty good. I just have to get over the mental image of what I'm eating though! Thursday evening there was a BBQ buffet for two of the Expats who were moving back to Kansas City. The BBQ was pretty good, but it's the first time I've seen rice at a BBQ! We took a taxi from work to get to the restaurant but it was only a few blocks away from our hotel, so we walked back. It was interesting seeing the city at night like that. From the street vendors to the "city workers" who were fixing the sidewalks to whatever!As soon as we got back to our hotel room, it started raining. Just in time! After four beers Thursday night, I decided I wouldn't hit the gym. I figured I'd get a long run in Saturday morning, so the rest will do me well. Lunch this time was at another Thai restaurant... and another meal of food just coming and going, up and down the table. I don't remember anything extremely odd for lunch. Everything was delicious. It was a good ending to the work week. On the way back to the hotel, Peter and I stopped at the park next to the office to walk around. They were doing "Sister Cities of Bangkok", which appeared to be some kind of festival like a "Taste of the World". Peter and I took off for the hotel and changed. Nothing major planned for the evening, so we went to Siam and walked around a couple malls. No shopping intentions but just to see the spectacle. You don't see a lot of shopping malls with Lotus and Lamborghini dealerships. I took the photo below at one of the large intersections on the way to the malls. This is to give all the KC folks an idea of what it's like here. At stop lights all the motorcycle taxis (and any other motorcycles) will drive through all the stopped/waiting cars up to the front of the line. Watching them take off is like a motorcycle race!